It's almost a year since I've shown this project, Hanami. It's my own adaptation of the traditional Tree of Life block. Most of my inspiration came from Audrey's trees here, except I changed the trunks to make them entirely from HSTs. Unfortunately, my first few attempts at the block came out distinctly rectangular. So, on my summer break last year I took the first blocks almost completely apart. The seam allowances were not consistent, and my setting will require precision. This time they look much better! Some of my pink florals are very light, and those dark browns completely drowned them out. I chose dark beige and light silver grey instead, because I want a very light, misty feel for this cherry orchard. I remember plenty of misty days in Japan! I think this will still work, because the pattern is set by the darker trees, so the eye will fill in the gaps. 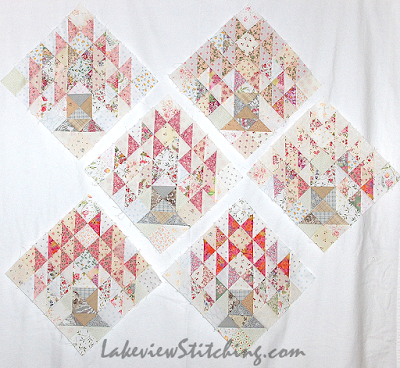 This quilt was my DIY Mystery Quilt, where all the pieces for each tree were drawn semi-randomly. Each block is a challenge! You can read more about that process here. ...and there are just seven more to go. Of course, my plan last summer was to have this flimsy finished by now. But, on my first day back in blogland last fall all my plans were thrown out the window when AHIQ came along, and they were ground further into dust by Allietare in November. And, going "off script" has been exactly the right thing to do, because both Allietare and the ongoing improv challenge have dramatically improved my quilting. I am amazed at how much easier these blocks seem now! So, there are no wrong turns. And, fingers crossed, I can still get this to the flimsy stage before this year's blossoms have fallen. 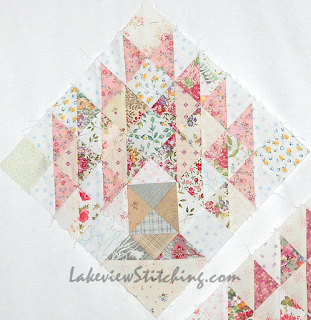 After two months of frustrating machine quilting, it is nice to be piecing again! Very nice and spring-like! Sorry about your snow, but that does happen when you live so far north! We are having beautiful weather right now but that can certainly change. Oh my, how gorgeous they are! Well done! 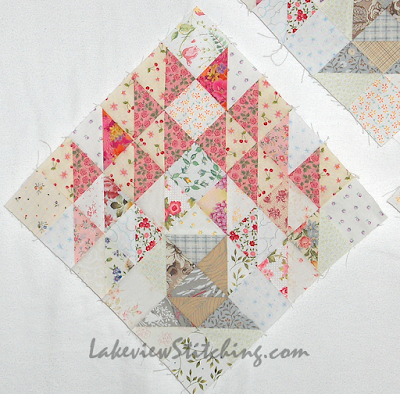 This is really going to be a stunningly beautiful quilt. 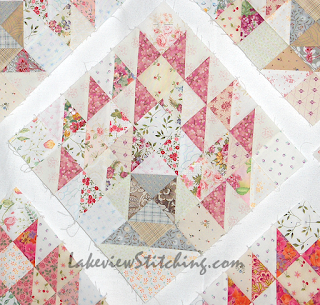 I just love the fabric colors you decided on - I think the reds/pinks are just perfect with the grays/light beiges. Well Done! And I can't wait to see it when it's finished. Just beautiful!!! 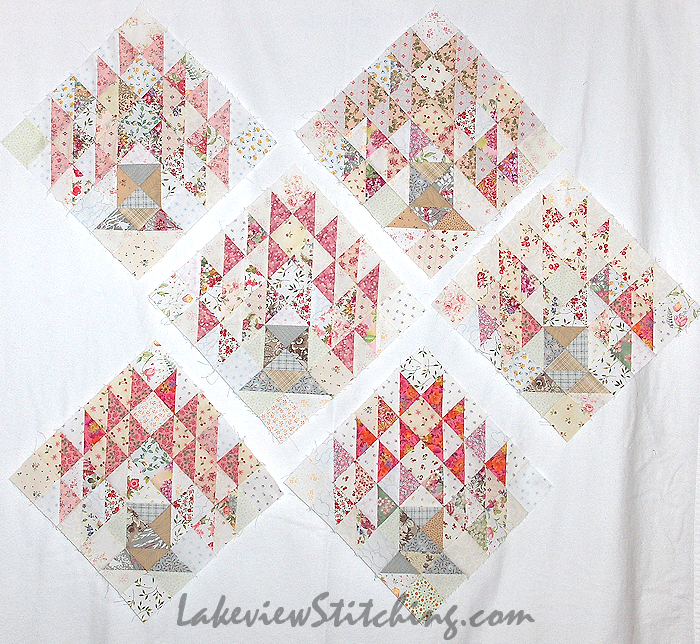 Love your cherry tree blocks. Great choice for the new tree trunks, you have achieved the light and misty feel you were looking for. I LOVE your tree variation. Do you mind if I copy it? I've been looking for a very similar tree, but nothing quite thrilled me. Yours does. What you did with the trunk is especially nice. Aside from the pattern itself, your colors are just gorgeous. Can't wait to see it done. Thank you, Carole! Yes, anyone can copy my block for personal use. If you want to publish it, that would be different. In that case, please get in touch. Good luck! Thank you! No worries about publishing - I'm not that good! What a fantastic springy quilt. Love the softness of the trees, and it looks like the petals are falling from the trees and that you are surrounded by falling cherry blossoms. wonderful job with the trees and the trunks. What a change a tree trunk makes! It not only has the misty feel you were after but it has a romantic feel to me. I'd love to be in that orchard! 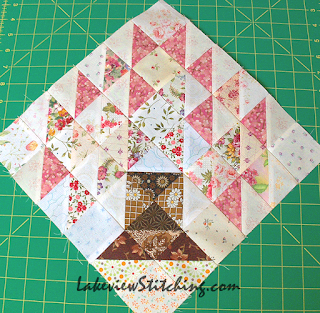 Totally love your blocks - they are just perfect with those soft floral prints and really do evoke the lovely spring Cherry blossoms. We're into the polar vortex too so it will be a while before we see Spring blossoms so this was a great hint of things to come. Love the changes you've made to the block. The soft colors do give the sense of the beginning of spring and a misty April morning despite the Siberian cold. There's a bit of an ethereal feel to your trees. Love them! I've never been to Japan, but it's on the to-do list. One of these day! Have you spent a lot of time there? Also, very true what you say about taking up challenges that don't necessarily follow the script. Nothing helps the learning curve more then a challenge. Good luck finishing the flimsy. It will be a very beautiful quilt. Thank you! I was in Japan a few months. It is a wonderful country, I still hope to spend more time there. Two more trees done today! So encouraging that you can notice your skill improvement. The blocks are lovely. They brought to mind Houseman's poem " Loveliest of trees", which I liked a lot when "of my three score years and ten, twenty will not come again". Now that I'm almost there, there's a lot of pleasure in your quilt! This is truly beautiful, Monica. So soft and delicate (love the change to the trunks) and evocative. beautiful! "there are no wrong turns" - love it! Thanks very much, Terry! Sometimes a new perspective makes all the difference. I'm happy with how it's going now! Love your trees! The colors are absolutely gorgeous. Really soft and springy. The cherry trees bloomed here a while back but oh, how yours remind me of them. Wonderful idea to adjust this pattern. 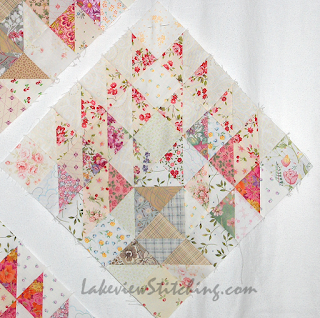 What a lovely spring quilt you will have. Your tree blocks are gorgeous! I think the new trunk looks much better. Our trees are still blooming here and these blocks really capture that soft, delicate Spring-y look. Very, very pretty. So ethereal. I never had the good fortune to visit Japan, but I have been in Washington, D. C. When the cherry blossoms were blooming. I think your blocks capture the effect perfectly. Also good choice on changing out the trunks to lighter colors.